ESRB Rating: E, no content descriptors. Date of release: 1997, July 1st. Starfox is, for the most part, an on-rails shooter in which you control an “Arwing” fighter or tank (even a submarine once) to save the planetary system of Lylat, which is the world you explore during your time in the game. 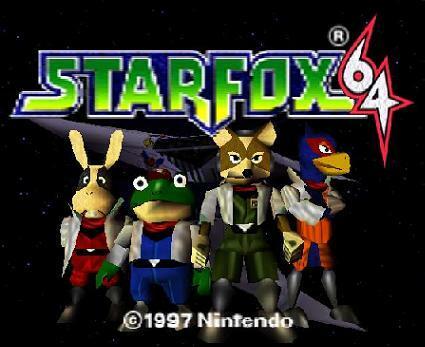 Starfox is a team of mercenary animals comprised of Peppy the Hare, Falco the Falcon, Slippy the Toad, and, finally Fox McCloud, the game’s hero. This game features a branching path system with three different paths’ to choose from: easy, medium, or hard. The path you choose will influence which ending you get after beating the game, and it can be rather tricky to stay on the hard path and get the better ending. Not only will you have to shoot down hundreds of foes, but you’ll also have to complete side objectives. Those range from shooting a certain amount of enemies, to hitting specific objects on the level, or even keeping a teammate alive. Needless to say, the game’s replay value is exploring all three paths. You can also find items such as the laser upgrade or bomb lying around in every level. Gathering these is important because you’ll need them later. There is also a training mode for those of us who need to practice our U-turns and blasting maneuvers. But the meat and potatoes of the game are the frantic twisting and turning you’ll need to do while shooting down enemies. The controls are very smooth and nice. The scheme depends on what controller you\'re using, but the basics are simple: move your ship and crosshairs using the control stick. Press the L or R buttons to do a barrel roll, and use the A and B buttons to shoot lasers or bombs respectively. Pulling off U-turns or somersaults is easy to do. Press a button and pull back on the control stick at the same time. The control shifts depending on what vehicle you’re controlling. The Arwing responds beautifully, with quick movements and easy maneuvering. Whereas the tank is slower and takes more time to move around. The sub is actually somewhat difficult to control because it’s slow and, well, underwater. I honestly have nothing to complain about. The sound of Starfox is good. Not symphony good, but really good for a shooter. It has a surprising amount of voice over work throughout the game. But they do occasionally sound somewhat tinny or muffled. Maybe they were going for a ship-to-ship audio effect, or maybe they aren’t very high quality. It sounds fun either way. Regarding the musical score, most of it is very good. There are a few less than fantastic songs and noises though, as the thousands of laser blasts your bound to hear will get old after awhile. Some of the music will be forgettable, but some of it, like the opening and closing themes, are pretty enjoyable to listen to. Actually, Koji Kondo created the musical score (For those who don’t know, he is to be “blamed” for creating the Super Mario Bros. music and most of the Zelda games, as well.) so it’s not too surprising that the large part of it is very good, and enjoyable. As for the graphics, Currently, they would be laughed at. But back in ‘97 they were pretty good. Not the best mind you, but the bright colors, full 3-D animation, and great particle effects would have drawn an admiring glint from anyone’s eye. Compared to other A grade Nintendo 64 titles it stood up well for the time period. The lasers even leave burnt marks on the ground if your blasts happen to fall there, and one level has a sandstorm blowing through it while you traverse the desert sands. They were good for ‘97, real good. And it runs very nice with no frame breaks or jerkiness, which is commendable for any era. Though...Whenever the characters in the game decided to drop a comment, a little window appears on your screen, nothing bothers me in this except the fact that their mouths move like puppets, just up and down. No sideways motion. It’s more humorous than it is bad, but I thought it worth mentioning. The appropriateness is pretty much clean. Language gets nearly zip with several uses of “dang.” Not sure if that would bother anyone though. Occultism is also nil, which is less than surprising. It was mainly violence that dropped those few points. Throughout the game you’ll be killing hundreds of baddies. Most of them explode in a puff of flame. But a few of them are animal’s, bird type things, which kind of fall apart. Also, on Solar, you fight a lava monster which losses its head and arms before finally succumbing to your laser fire. In the final fight with Andross--the real Andross, not the robot--you kill his head and hands and are left with an evil brain and two eyeballs--Which you then have to fight. And that’s the review. My final thoughts on the game are this: If you’ve not already guessed, Starfox is a favorite game of mine. The game has stuck with me through time. as a kid I loved the action, the heroism, and most of all; it was something fun to play. Later on in life, I began to enjoy the 90’s plot line, and fun voice lines taken from Star Wars that I hadn’t quite gotten as a kid. Starfox remains one of the most treasured games in my collection. It’s a favorite to be sure. The fact that Starfox 64 impacted at least a few of those who played it tells me to think its a classic: classics will remain loved by the majority of those who played it, and they go down in gaming history as such. Starfox receives a 42/50 for appropriateness and a 43/50 for gaming style. Adding those up leads me to a satisfying 85 or B as its total score. Final score: 85 which receives a B.